I had just reached “Onederland” in my weight loss, which was a milestone I couldn’t believe I’d reached. Now I’m celebrating being at my goal weight, 38 pounds down from this time last year, and maintaining it for 6 months. Every day I am less and less fearful that I’ll regain it all. 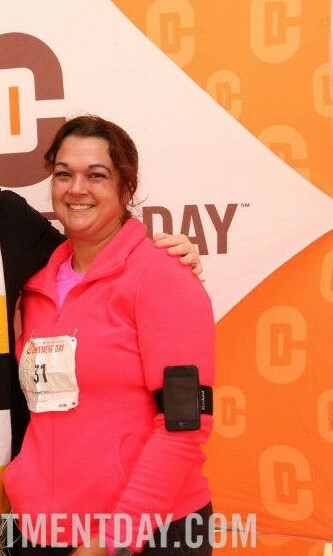 I had just finished my very first 5K (Commitment Day). I remember feeling so unsure and almost embarrassed to describe myself as a runner at almost 200 pounds. I didn’t have the fancy gear or have any idea what I was doing, but I was lining up to start my New Year by running in single digit weather. My first inclination in times of stress was still to eat and eat and eat some more. Now, those moments are fewer and farther between. Honestly, my first thought now is just to go out to run. I was planning on taking my son to see Disney World for the first time. I wasn’t even aware that there was such a thing as RunDisney or the Princess Half Marathon. Now I’m planning on actually running through this very castle! In less than 8 weeks! I’m also, little by little, gaining in confidence and peace about my role as a mother. I am blessed to get to help this little soul get through life and while I still struggle with self-doubt and impatience, every day gets easier. I can’t wait to see what 2014 brings! I’m off to close out 2013 with a run at the gym and some snuggle time with my two favorite guys. Everyone please celebrate safely tonight! The only running goal I had last year was to finish four 5K’s, which I did (and then some!). Now that I feel more confident in myself as a running, I’ve set some more ambitious goals for my running for this year. Cross the finish line of my first half-marathon: In February, I’ll cross the finish line of the Princess Half Marathon. I have no doubt that I’ll be able to complete the 13.1 miles in the time allowed but am still sort of stunned by that! I cannot even imagine what that’s going to feel like. I don’t think I’ll be setting a time goal for the race as a) it’s my first half marathon, so just finishing is a PR; b) it’s a RunDisney event, so with the pictures and crowds and course entertainment I know it won’t really run like a normal half-marathon would; and c) I really want to enjoy myself along the way, so I don’t want to push myself for time. Take a step up in my running to figure out how to incorporate some speed work into my training: Right now, I just head out to run certain distances a certain number of times a week. 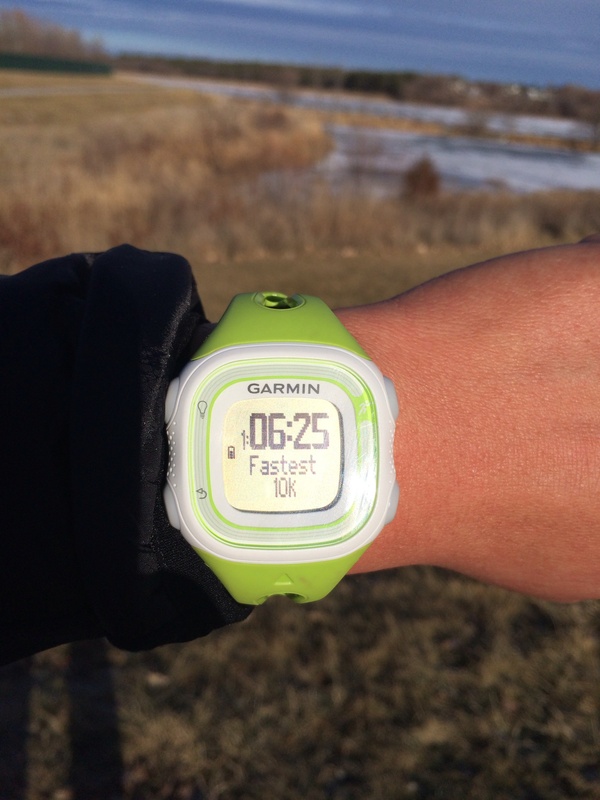 I’d like to work on more purposeful runs and speed work seems like a good place to start. It’ll help me to both get faster and to learn to better regulate my pace during my runs. After I get a better at speed work, I’d like to work towards a new 5K PR. 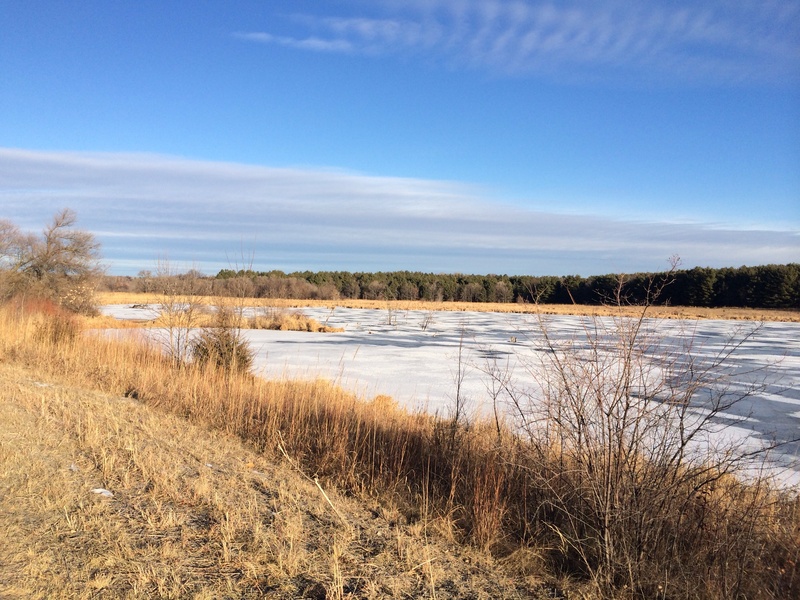 I’ll have to look around for a good timed race locally – maybe in the late spring? If I get through the half marathon safely and having fun, I’m going to look into running another half marathon – this time with a time goal. I’m thinking about the Des Moines half marathon in the fall – close to home and would let me mark another state off my running & racing list. After doing all of these running events this year, I am so impressed with the amount of work the volunteers put in to make the day run smoothly. I’d like to volunteer for a race somewhere here in town this year. 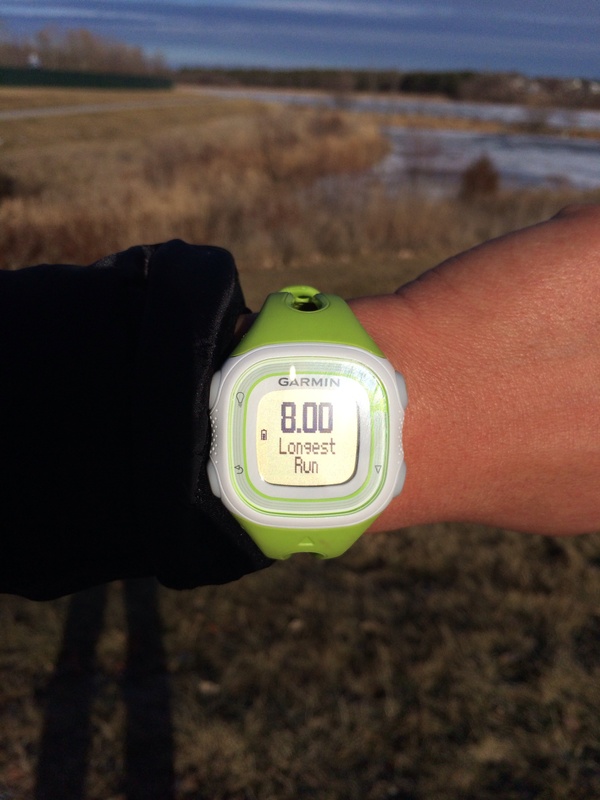 What are your running goals for the year? Less than 8 weeks to go! This has been a glorious week off, with lots of times to finish up chores around the house and get some good workouts in. 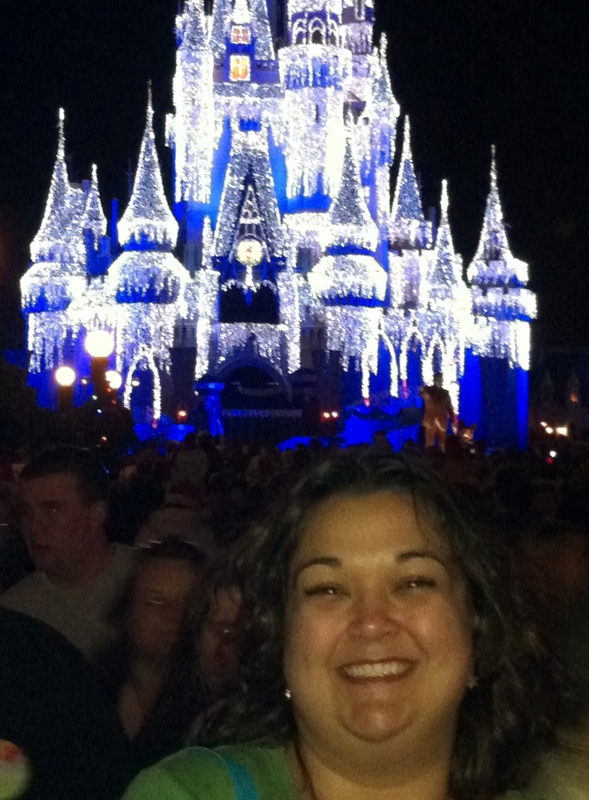 This week also marked the 60 day point, so the trip to Disney World is getting really close! Very exciting! We’ve starting talking to O more about the trip to get him ready for it. It’ll be interesting to see how he enjoys it this time. He had fun when we went a year ago, but he’s so much older and more interactive now. As soon as you mention going to Disney World, he starts talking about Mickey and the castle and the train. I’m not sure if he actually remembers the train or if he just assumes, like most 2 year old boys would, that anything fun has to include a train ride. This week’s runs have all felt really good, which was much appreciated since the last couple of weeks have felt like a struggle with the weather and life stress sapping my energy. I needed a good week to give me the oomph to move forward! Monday: Single digit weather, so I hit the treadmill for a good 4.5 miles but man did they feel good! Tuesday: Windchill advisory all morning, so I headed to the gym again to get 3 miles in quickly before my husband had to go to work. He had to work, but as daycare was closed, I was home with O all day. I headed to the gym at 6 so I could finish and get home before my husband had to leave. The gym was absolutely packed! I guess lots of people were getting their early morning workout in before Christmas festivities started in earnest. Wednesday: 35 minutes of yoga from my new yoga for runners for book – it felt good to stretch the kinks out before my long run Thursday. Friday: 70 minutes yin yoga for my cross training for the week, which helped with the little bit of pain I still have in my left upper thigh/lower glute. I also finally finished the Christopher Eccleston season of Doctor Who while I failed miserably in my attempt to assemble the train table my parents got O for Christmas. Saturday: Rest day while my parents are here visiting O for Christmas. Sunday: I’m planning to get in 4.5 miles this afternoon after my parents head back out. We’ve got cold weather coming in, so we’ll see how slick it gets outside before I decide on outside vs the treadmill. Hope your holiday week has gone well and you’ve been able to get your workouts in! Bring on the new year! New running toys for Christmas! I was apparently a very good girl this year because I got lots of new running toys for Christmas! I’ve already taken some of them out for a test run and can’t wait to try out the rest of them. We’re considering our trip to Disney our Christmas gift to each other, so my husband and I agreed to do just stockings for each other this year. Neither of us are very good at following instructions, so we both had overflow boxes for each other of course but at least we stuck to stocking-type gifts in principle. 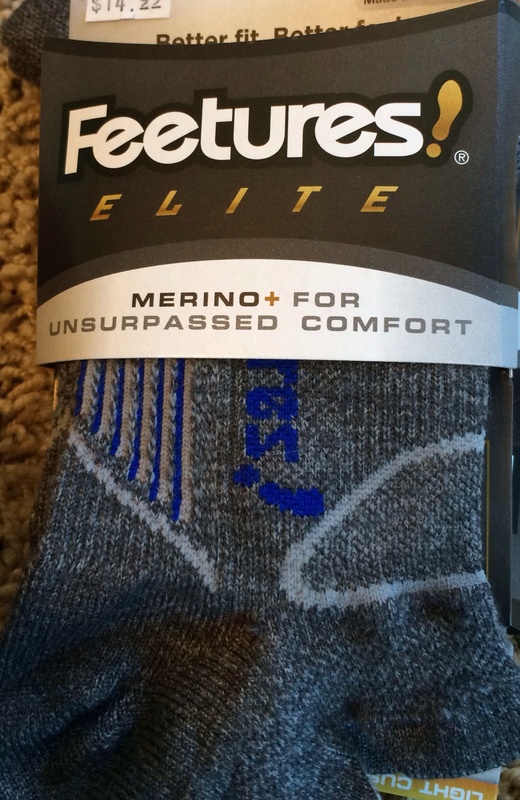 He’d filled my stocking with lots of great new running toys, including two new pairs of socks (I really love the Feetures wool socks) and a big handful of salted caramel Gu’s. 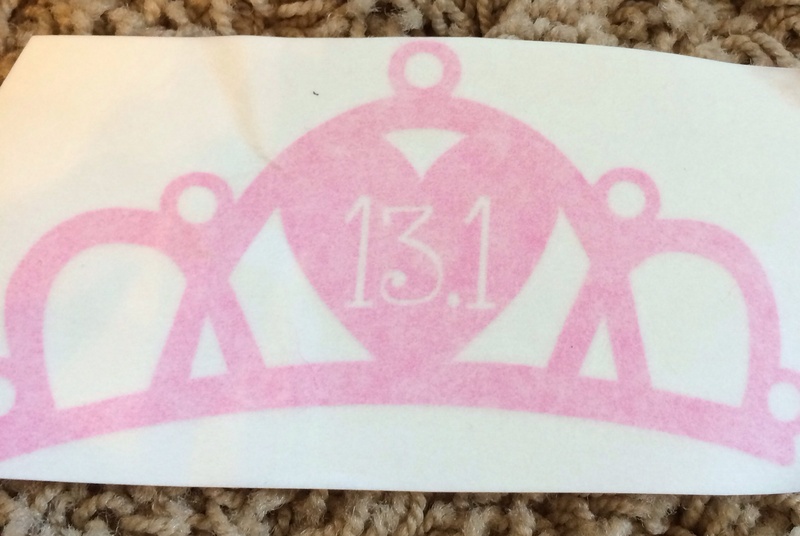 He also got me a new pair of running gloves and a princess themed “13.1” decal for my car for after I finish the Princess Half Marathon. 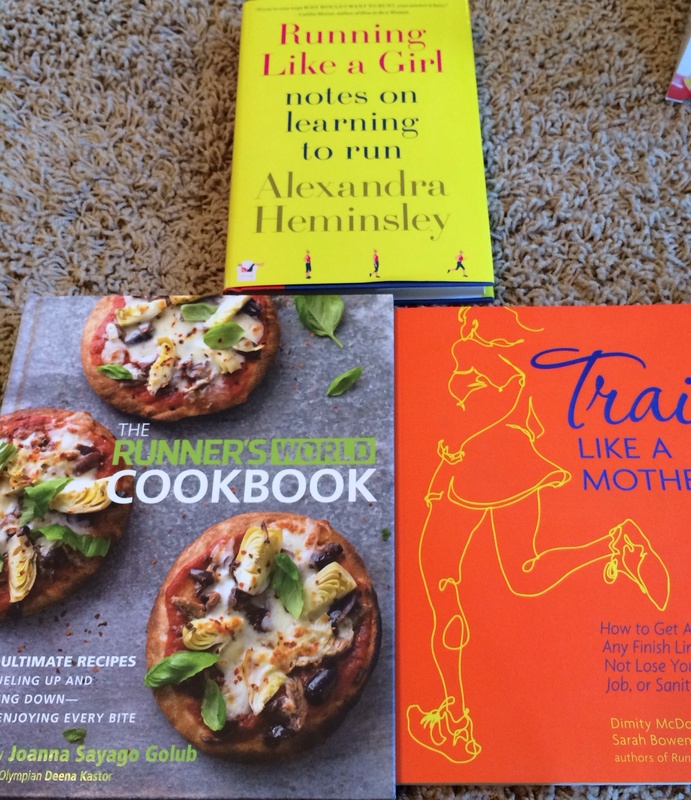 I got several new running related books, including the Train Like a Mother training guide, the Runner’s World cookbook and a memoir Running Like a Girl. I’ll be sure to update you guys with reviews of these after I play with them a bit. 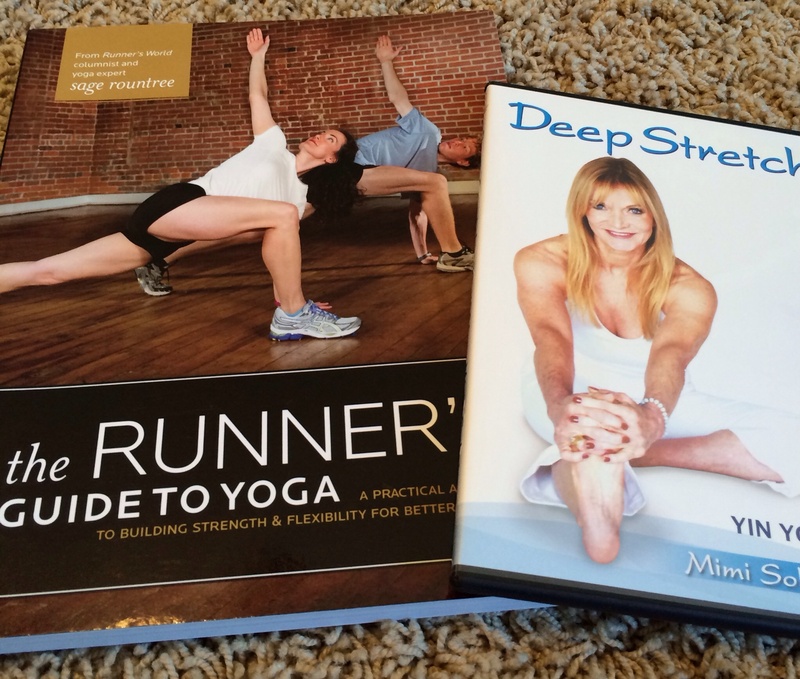 I also got a yoga for runners book (and have already flipped through it to try some of the series – very nice!) and a yin yoga DVD. I added a new set of sleeves, ear warmers and a shrug to my collection as well. Thanks to everyone for so many great new things! I’m looking forward to playing with it all. Did Santa bring you any fun new fitness toys? 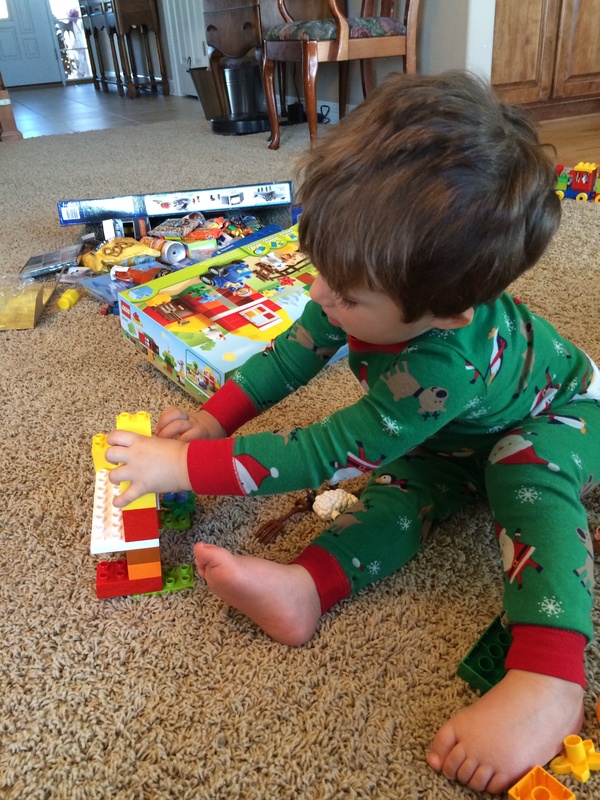 Instead of my usual Friday Favorites, I find myself thinking back on my favorite moments from Christmas. I want to savor these moments, to take more time in my life to appreciate it and there were so many great moments this Christmas. I was the first person awake in my house. 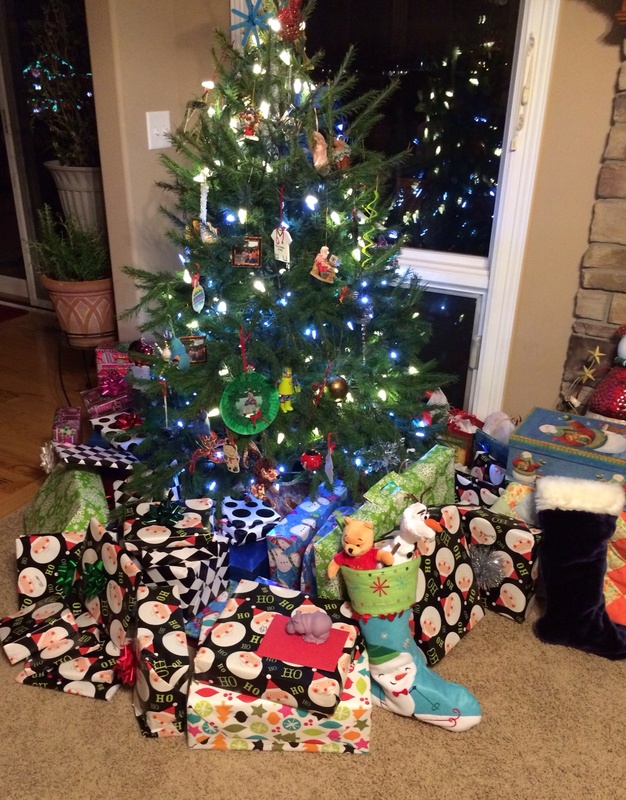 It was so peaceful to sit on my couch and gaze at the tree, all lit up and surrounded by gifts. Of course, being a child inside, it wasn’t long at all before I was wishing everyone else would wake up so we could open our gifts! After a while, I finally heard O wake up and went in to get him. My husband and I had discussed bringing O into bed like usual to eat breakfast before we went in to the tree. When we went in to get him, we wished him Merry Christmas and he did the same for us (love that little quiet breathy “Merry Chrissmas” of his). I asked if he thought Santa had come last night and he said No, which was funny. He’s only just starting to understand the whole Santa thing. I couldn’t resist the urge to show O the tree when we walked down the hall from his room to ours and I hope I never forget the wonder in his voice when he saw it and said “Yay” in the quietest, little awe-filled voice. He then immediately wanted to get down and go check out the little hippo on the top of the pile. When we went to see Santa, he asked for a hippo so we wanted to be sure that was out for him to see first thing. After a hard fought nap (who wants to go down to nap when there are new toys to play with after all), he woke up and just wanted to sit with me and snuggle in his bed for 5 minutes before we went back out to play. That warm little body wrapped up so close to mine is a feeling like none other in the world, full of love and trust. I know I need to cherish those moments because before I know it he’ll be too big for those snuggles. As much as I spend this space talking about making changes to my physical health, I know I need to spend just as much time and energy on my emotional health. I can get so caught up in the day to day struggles of parenting a two year old, working and keeping my house and family and marriage running that I forget to appreciate the beauty in my life. I also struggle to forgive myself for my failures as a wife and a parent. In the midst of these great moments on Christmas, I also got frustrated when I spent hours prepping and cooking for a nice Christmas lunch, only to have O not touch a bite of it. Sigh. Totally normal two year old activity I know and less than a tenth of my impatience actually leaks out of my head to my kid, but I beat myself up for it all afternoon. That after nap snuggle was a balm to my soul. We spent the afternoon playing with new toys and cleaning up (always cleaning up). That night before bed, my little guy wanted to have a big family hug with both of us and him. 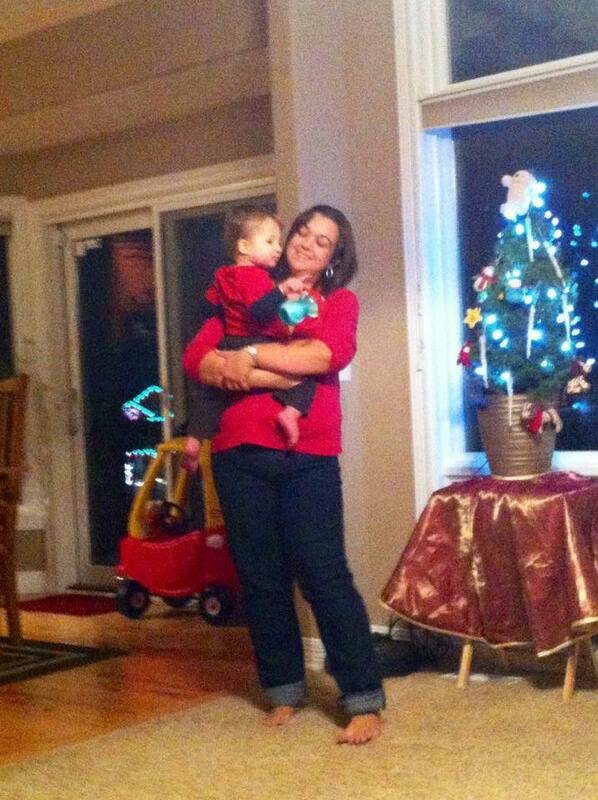 Those little warm arms and that little “love you” was absolutely the best Christmas gift. I hope your holiday was full of beautiful moments as well. Be sure to take the time to appreciate them. The hours are long but the years are so short. A fantastic 8 mile run! That is a statement I never thought I’d make, but it is true. I knew this would be a good run because my earlier runs this week (4.5 and 3 miles) felt wonderful. I got up this morning, sent O to school and hit my favorite park for a good long run. It was bright and sunny and not too cool (mid 20s). The former-fat girl part of my mind was a little boggled at the rest of me, which was looking forward to this run. 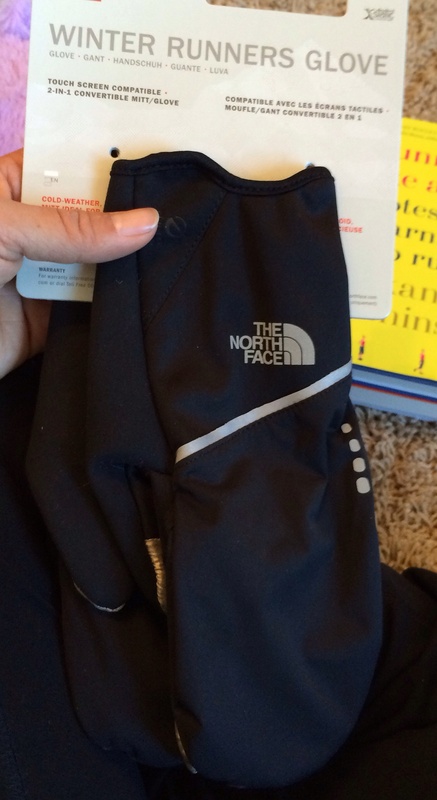 I got to try out a few new Christmas gifts, including new gloves and an ear warmer (Thanks Darrell & Mildred! ), as well as new running music. The AC/DC live greatest hits album is fantastic running music (Thanks Jamie!). The one and only time I slipped was as soon as I got out of the car, because there was some packed snow and ice in the parking lot. 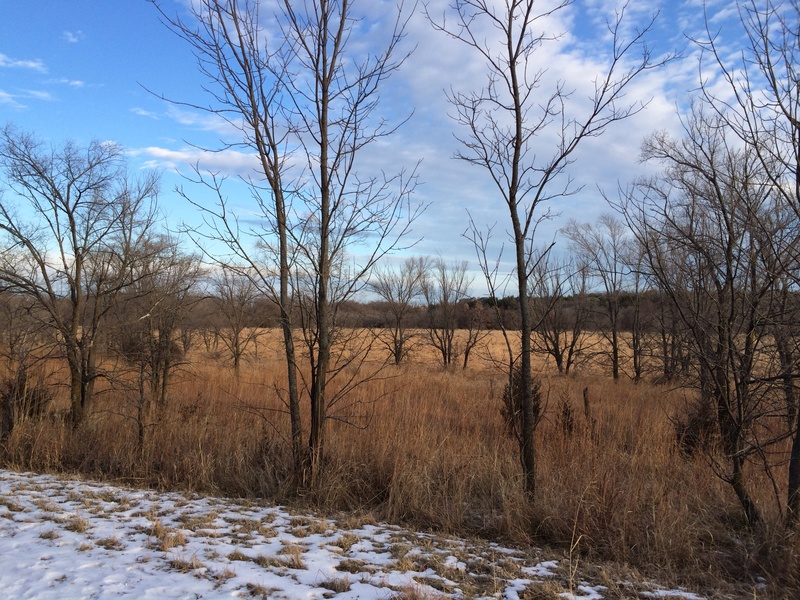 Otherwise, while there was some snow out on the trail, it wasn’t too bad. The first 4 miles felt surprisingly easy – no aches, not too tired and not feeling like I was working too hard at all. Halfway through, I stopped at the car for some water with Nuun and a salted caramel Gu (goodness gracious those are delish!). It was harder to get started again after that little break, even though it was no more than 2 minutes, but I kept going. I’d been allowing myself one walk break each mile for no more than a tenth of a mile and hadn’t been using that break each mile. In the second half of the run, it was harder to get started again after the walk breaks but I could definitely keep going. Around mile 7, I got a pain in my right ankle and somewhere in my upper hamstring/glute region but those were gone after that mile’s walk break. I’m really amazed at how well I held up during the whole thing! I was tired at the end but can definitely see that I’ll be ready to do 13 miles in less than 60 days. We all just stared at each other for a minute. They didn’t walk away until I did. 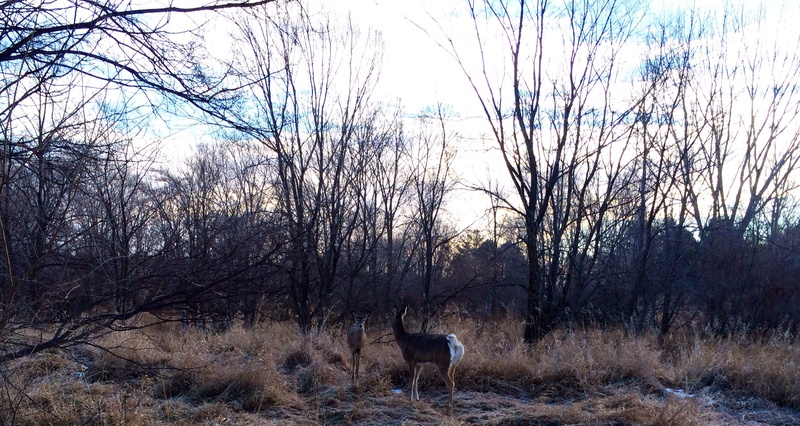 Living in the city, I don’t run have many close animal encounters (aside from the abundance of rabbits and turkeys in Omaha). It felt like a little cosmic reward for being out to enjoy the day today. I’m excited to see that my 10K time is faster today than it was back in September at my first official 10K race because a) I was in no way pushing today like I was in that race setting and b) this time included several stops for pictures and walk breaks, none of which I did back in September. I do enjoy that I’m getting faster the more that I run. 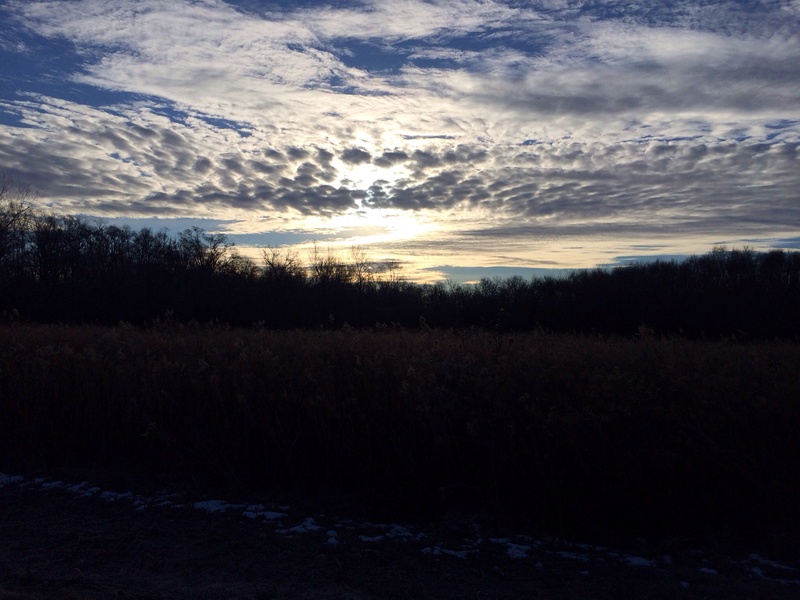 I hope you all are enjoying your long runs! 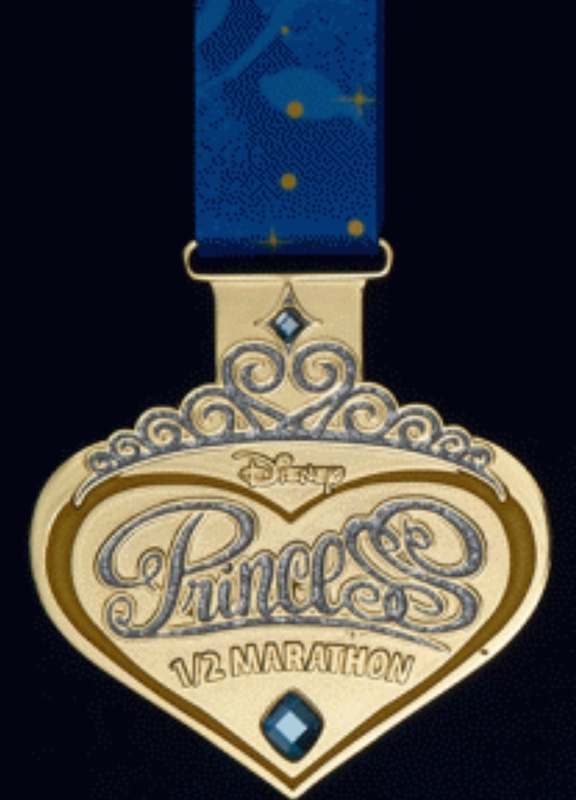 Princess Half Marathon will be here before we know it! 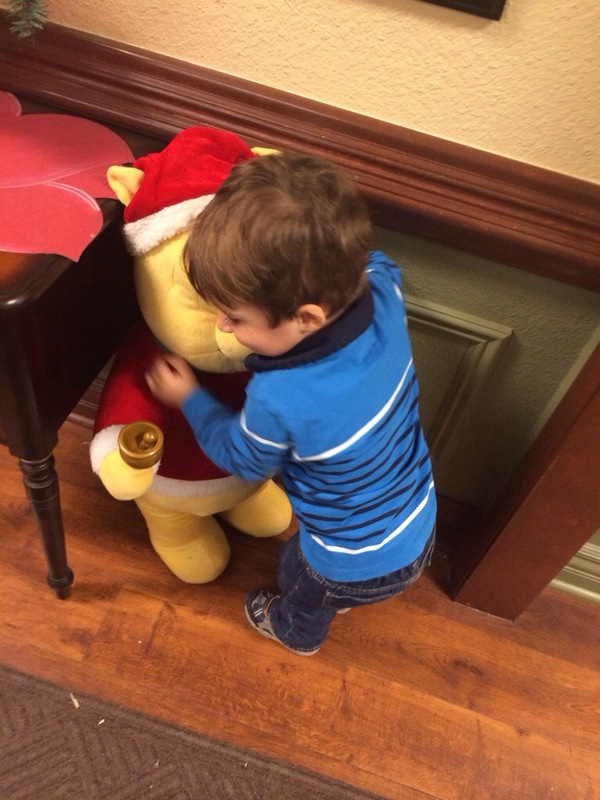 I hope today brings you all peace and joy (and hugs from Pooh Bear if that’s your kind of thing)! Our family tradition for Christmas Eve is to spend the day making (and eating) snacks and treats while watching our favorite Christmas movies. My husband and I have done this every year since we’ve been married (except for one spent away from home when my grandfather was sick). 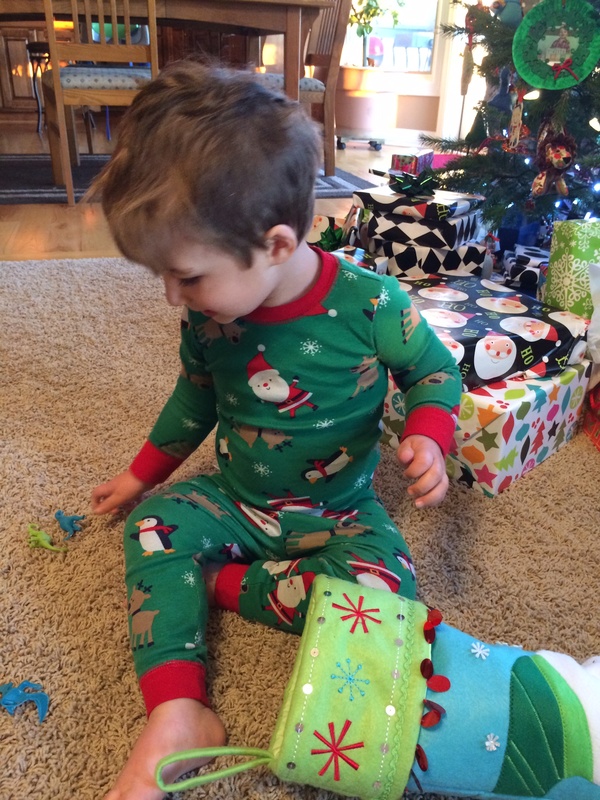 I love that a tradition we started when we were just a baby family is something we get to really introduce to our son this year, now that he “gets” the holidays a little better. I’ll be home most of the day today with O by myself as hubby has to work until 2, so I’m sure we’ll be watching “Mickey Christmas” over and over if he has any choice in our holiday movie selections. He absolutely loves anything Mickey Mouse and particularly loves the “Once Upon a Christmas” and “Twice Upon a Christmas” shorts. I’ll see if I can rotate in some other cartoons that I like, like the Guardians of Childhood movie (that I’m blanking on the title of! O does love the fighting Easter bunny so this will be an easy sell) and Charlie Brown (although O would rather than just be about Snoopy at this age). After O goes to bed, my husband and I will get to watch our favorites, like Christmas Vacation (which I think I can quote in its entirety – LOVE), Scrooged and Die Hard 1/2 (which are absolutely Christmas movies, right?). We’ll also spend some time making treats, which was conveniently one of my goals for December. I’m happy to say that I have found a couple of fun new holiday snack options. Two of the treats we’ve tried and liked from “indulgent” – i.e. not light – end of the spectrum are the Pioneer Woman’s Marshmallow Pops and Trisha Yearwood’s No Bake Chocolate Pretzel Peanut Butter Squares, which have a cumbersome name but are delicious. The marshmallow pops are really simple and fun if you’d like to let your kids get in on the action. We tried these out because my oven died and it gave O the chance to do some sprinkling (he loves sprinkling!) even though we couldn’t do sugar cookies. 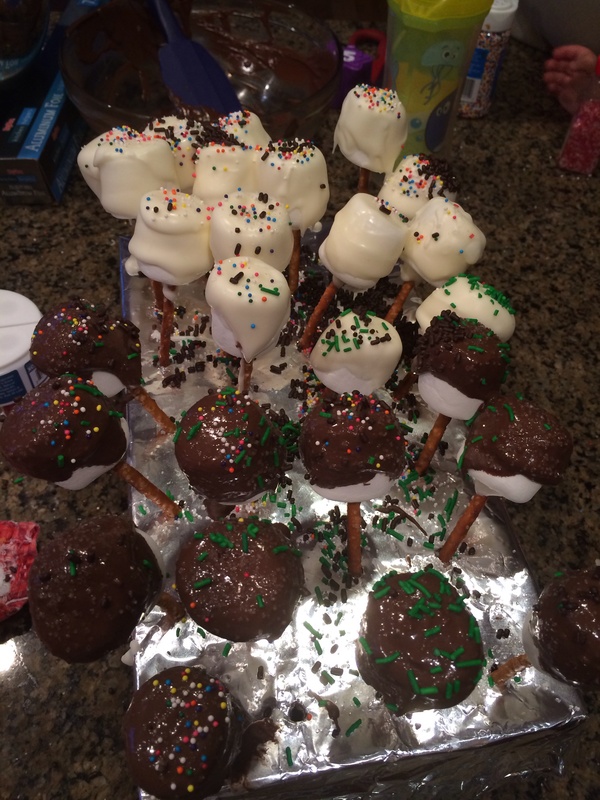 The only variation I made from the original recipe (linked above) is to use small pretzel sticks instead of traditional candy/cake pop sticks. I honestly went this route because my grocery store didn’t have the candy sticks, but it ended up working out nicely because they were sturdy enough to work like the candy sticks and you had a little chocolate covered pretzel as a snack after you ate the marshmallow. A win win! To make these, just melt almond bark (I did vanilla and chocolate and stirred some crushed peppermints into the chocolate bark before we used it). Stick your pretzel stick/candy stick in the almond bark before you stick it into the marshmallow – this really helps the marshmallow stick hold onto the stick. Let those set up for 20 minutes before dipping the marshmallow back in the bark to coat the top and then sprinkle to your heart’s content. You could also roll these in crushed cookie crumbs or peppermints. O had a great time making these! The peanut butter pretzel bars never hang around long enough to take a picture, which is recommendation enough for this recipe right? My husband actually prefers these to chocolate peanut butter balls (buckeyes) which is seriously saying something! I followed the recipe (linked above) to the letter for this one except for a) making it in an 8X8 pan so they were thicker and b) sprinkling a little finishing salt over the top of the chocolate at the end to echo the saltiness in the peanut butter layer. 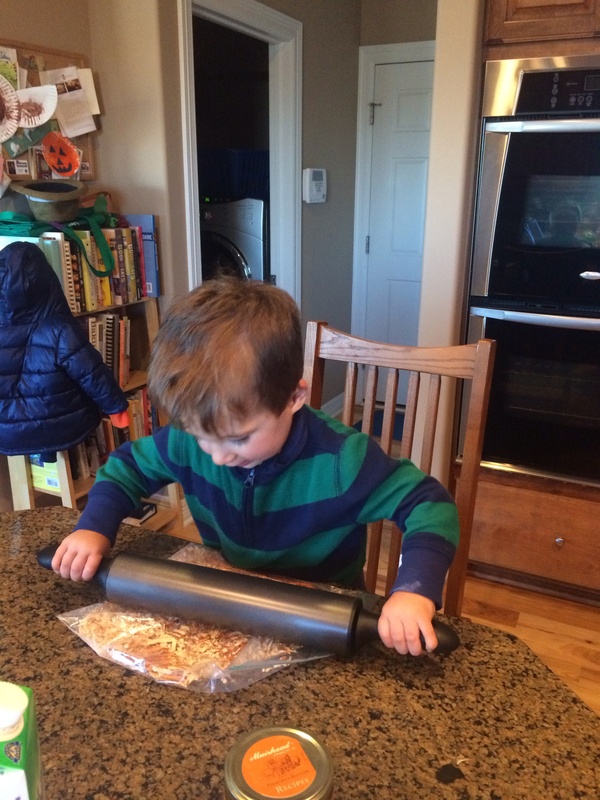 To make these, you just crush up pretzels (another great task for a kiddo!) and mix the pretzel crumbs with melted butter and powdered sugar for the base layer, then coat that with melted chocolate. Refrigerate until firm and then cut into squares – quick and easy and definitely delicious! Today, I’ll be trying out a couple of “healthier” treats and I’ll let you know how those turn out! 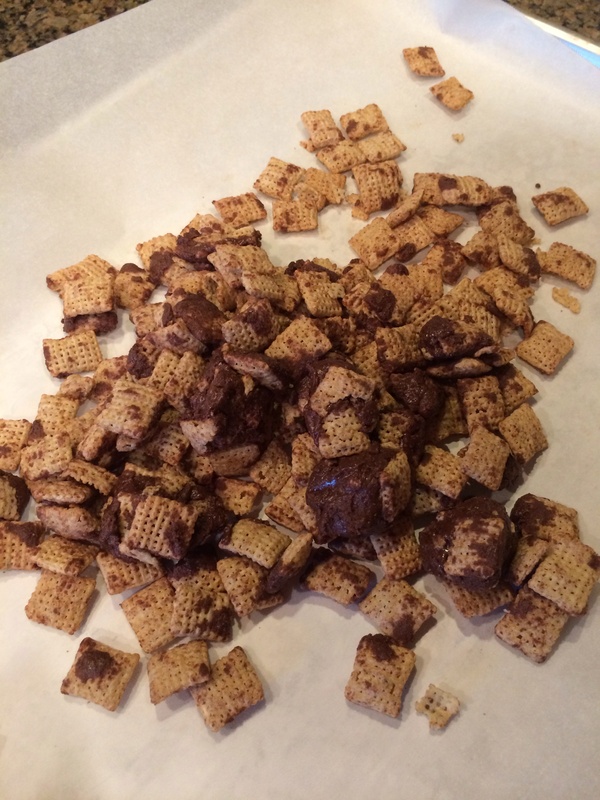 Hopefully better than this attempt at Puppy Chow (which my husband made me take a pic of for you guys) – kindergarteners can make Puppy Chow but somehow I screwed it up! It turns out, it really does matter that you drizzle the chocolate on first then add the topping (brownie mix in this recipe) or else you just get giant clumps of chocolate! What are your favorite holiday treats? Any Christmas Eve traditions? As of this morning, we are officially 60 days out from our trip to Disney! So exciting! 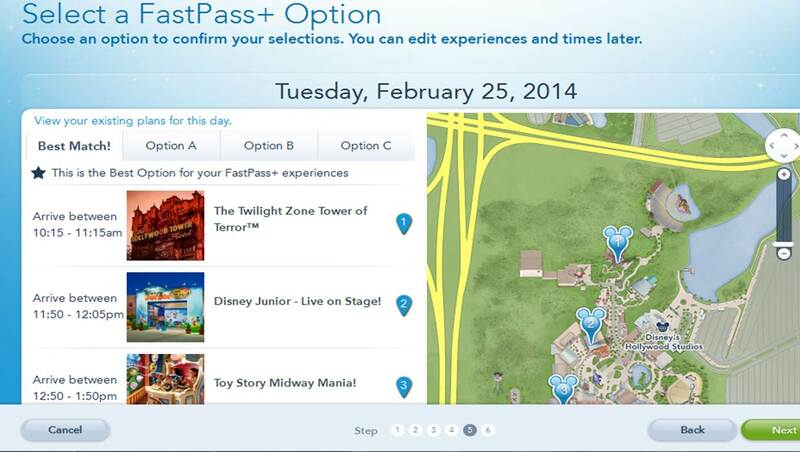 It also means it is time to set up our FastPass+ selections. We’ve already ordered our Magic Bands and made sure everyone in our party is linked up (which is crucial if you’re going to make your FastPass+ selections together). 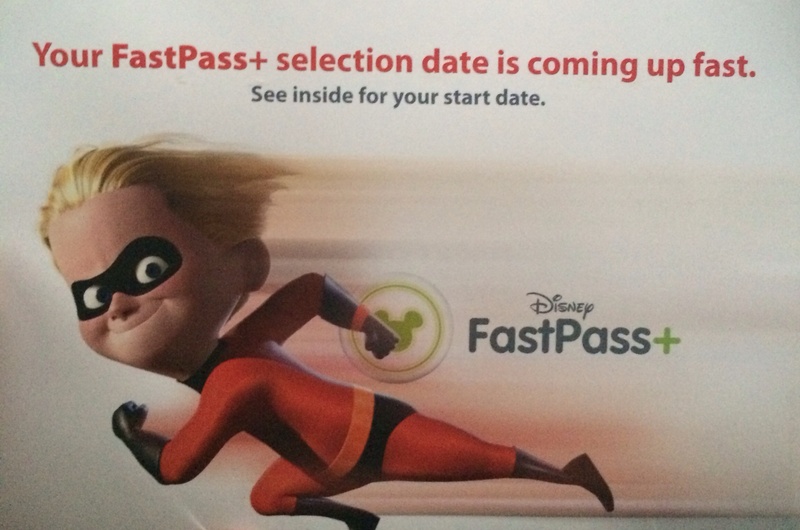 FastPass+ is definitely something that has caused lots of discussion since Disney started trialing it several months ago. 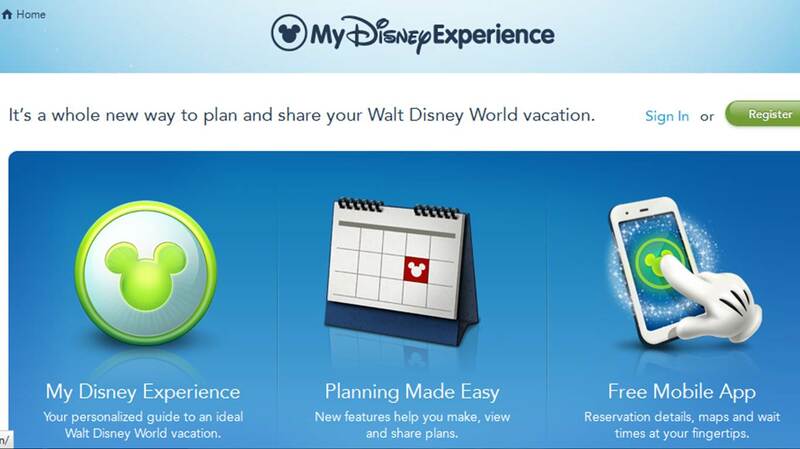 The Touring Plans explanation of the new system does a good job of introducing the new system and the rationale for some of the choices Disney has made with this new program (read here). 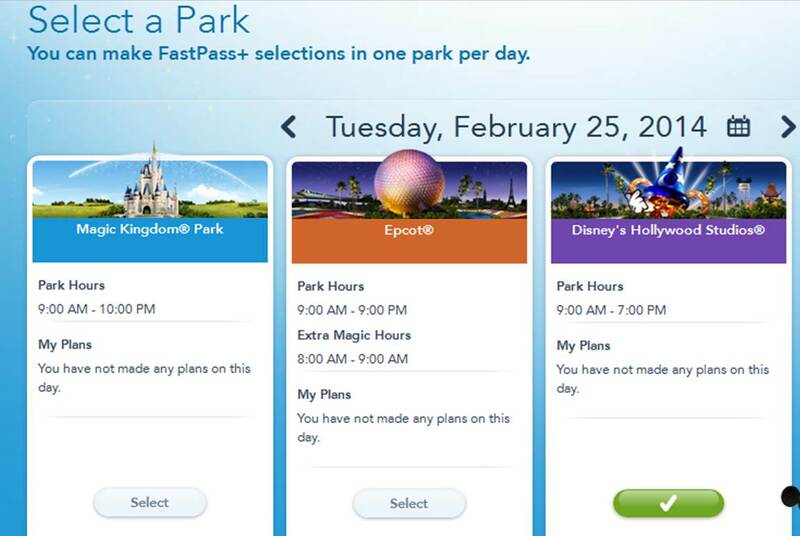 The thing that has been most upsetting for most people is the restriction to three FastPasses a day and to a single park a day. 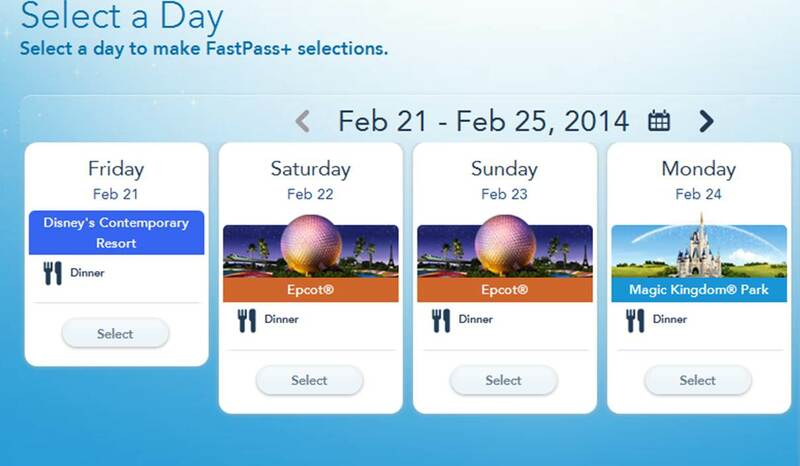 In the pre-kid visits my husband and I did to Disney World, we could easily get 5+ FastPasses a day because we moved through the parks fairly quickly and were good at planning our ride selections. We would also park hop a lot and get Fast Passes at the new park during the day as well. All of this is going away with the current plan (although in some parks you can still get traditional fast passes right now, in addition to your FastPass+ selections). This new plan would have drastically hindered our typical park touring (not to mention the tiering in Epcot & Hollywood Studios!). As this trip is with a two year old, we really aren’t anticipating a very fast pace through the park, so the limit in FP+ isn’t much of an issue. We’re just planning on doing what he’s in the mood for and taking it easy. I did go ahead and make some selections this morning, just in case they’ve pulled out the traditional FP machines everywhere by the time we get there. Anytime I can limit waiting in line with a two year old, I’ll do it! For anyone who hasn’t been through process, I thought I’d do a little walk through as I personally had a hard time finding out many specifics about the process beforehand. You’re then taken to a screen where you choose the first day for which you’d like to make choices. I started with our day at Hollywood Studios since Toy Story Mania is still one of the bigger draws and we’re going to try that one with O (although we aren’t sure how he’ll handle the 3D aspect). 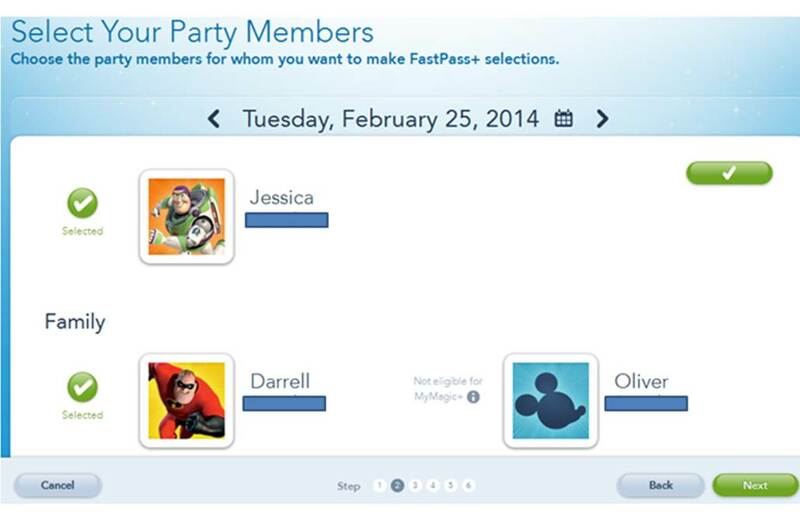 After you select a day, you select the guests for whom you’ll be making arrangements. For us, we selected everyone for each option. Even things like Tower of Terror that we’ll be doing in turns while the other adult hangs out with O, we set up in the same hour so we can just do it while we’re there. Notice that if you have anyone in your party under age 3, they don’t actually count as a selection because they aren’t traditionally ticketed. They just get to come along with whoever has the FastPass. Then you can choose your park. Remember that you only get to choose one park each day. Once you choose a park, you can choose 3 options for that park. You choose all 3 at once, rather than working one a time to set up a time for each item. I personally found that aspect a little clunky. For Epcot and Hollywood Studios, the options are tiered so that you get one option from Tier 1 (theoretically the higher demand items but Maelstrom? Really?) and two from Tier 2. There wasn’t actually a Tier 1 option we wanted from Epcot, but there isn’t an option to select three from Tier 2 instead. I’ve heard that I may able to manage this particular switch in the park. If you do not choose three options (for instance, we only selected two Tier 2 options for Epcot), the third option is assigned to you. I find this particularly ridiculous – I have FP+ for Soarin that I do not want and that takes a slot that someone else could actually use. It is building some artificial scarcity into the system. Unlike with the paper FastPasses, I can’t just hand it off to someone else in the park either. I’m hoping I can delete those or work around that when we actually arrive. We also got assigned FP+ for Dinosaur at Animal Kingdom because we’d only made two selections there on one particular day. Two things I’ve read about that were not available to us this morning: 4 FP+ selections at Magic Kingdom – we were only offered three; and parade / firework viewing at MK. I’ll keep checking into this as we’d be interested in the parade option in particular. Maybe it’ll pop up later. 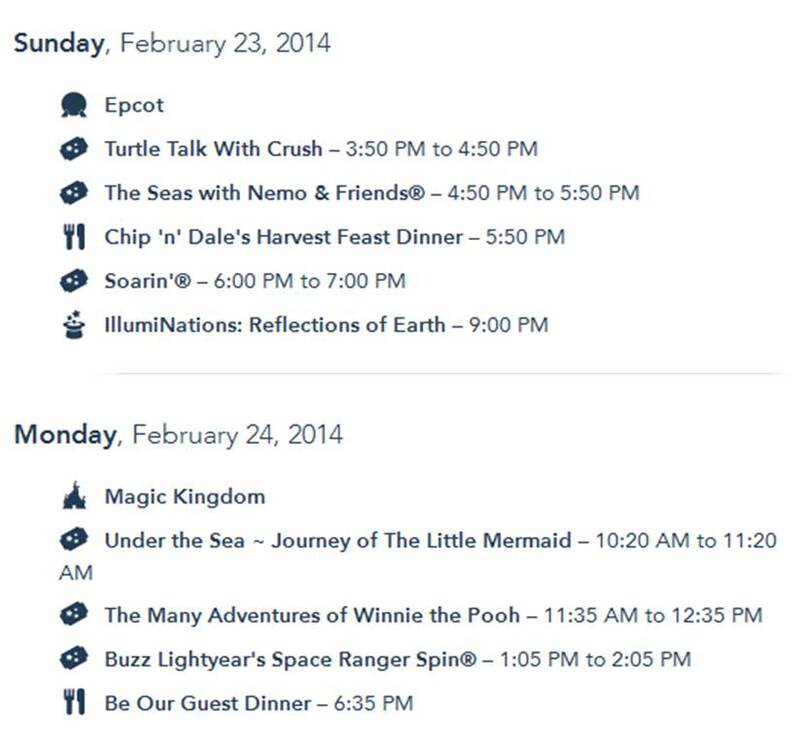 I’ve heard the Be Our Guest lunch FP+ option will pop up closer to the trip – maybe the parade is the same. On the plus side, under any of the attractions you could select it did list any height restrictions that applied so you didn’t waste a FP+ selection if your kiddo was too short. Ours is too short for anything with a height requirement at this point, which did help limit the number of things we could a FP+ for anyway (thus minimizing the “only 3” angst). You have the opportunity to prioritize your choices, ie which selection is most important to you. You are then presented with several options of times for your particular attractions. Don’t get unnecessarily frustrated with this part (like I did!). There will likely not be a perfect option and you have depressingly little input into the times you’re offered. Choose the best one to get them booked and then it is fairly easy to change the time of the individual event after you’re done (I did it on the app – far easier than working with the website!). I found the whole process to be slow and clunky, particularly given the server error over and over. I wonder if the whole thing would be easier to do through the app. I was able to go in and move the times around for lots of our FP+ on the app later in the morning much faster & easier than using the website in the first place. It is concerning that a lot of the money for this project was supposed to go into the electronic infrastructure to make the digital selection process easy for people – that was definitely not the case today! Once I had everything selected, I did go ahead and print out the itinerary. 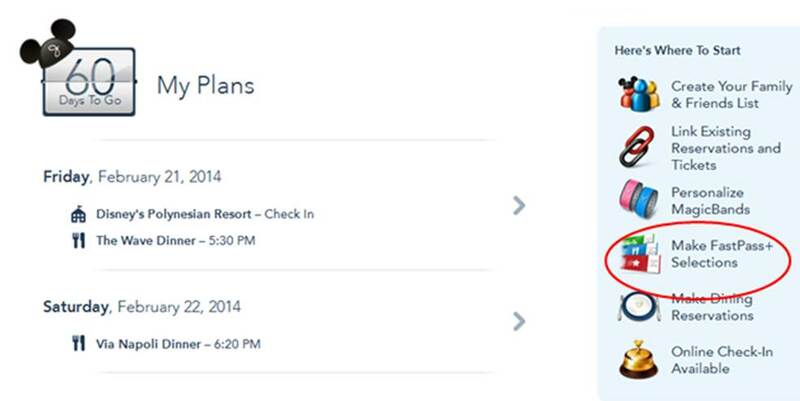 Early in the FP+ roll out, I saw lots of reports of people who weren’t having their previously booked FP+ choices recognized when they got to the park. Those that had their itinerary printed out had an easier time working with the cast members to get on the rides. It’ll be interesting to see what this does to lines overall in the park, as this process has added FP+ to several rides that didn’t have them before and forcing people to make FP+ selections (like Soarin and Dinosaur for us) is also adding some artificial demand. Hopefully, by the time O is old enough for us to cover more of the parks they’ll have this working smoothly! 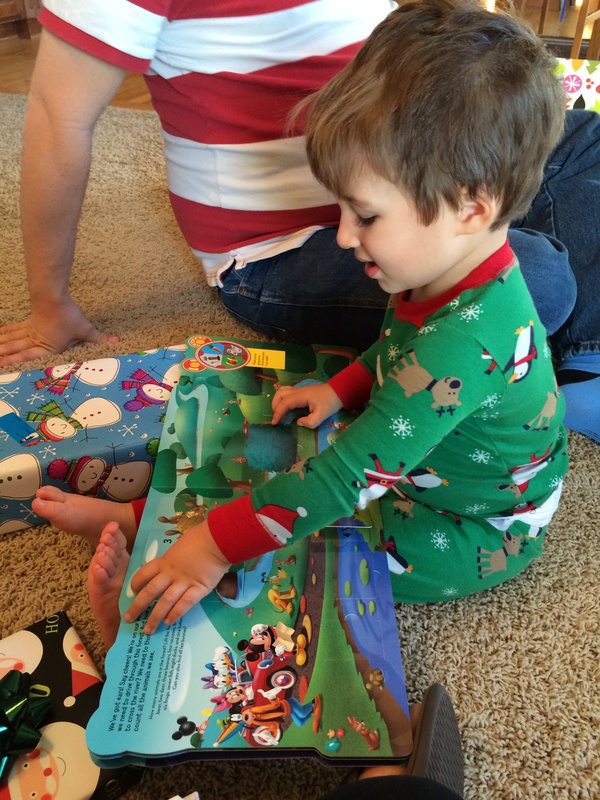 Weekly Wrap Up: A bit of funk, but looking up! Between a crazy last week of work before the holidays, erratic winter weather and a cold from my beloved husband and toddler, I have been in a bit of a funk this week. I have honestly lost sight of one of my biggest goals for this month, which was to take time to enjoy the holiday season. I can say that I have really tried to do that since Friday afternoon and I am already feeling the spirit! It helps that I’m done with work until December 30th and that we have absolutely nothing scheduled this weekend.It also really helps that I am currently listening to the soundtrack from the Epcot Christmas Candlelight Processional with Phylicia Rashad as the narrator. 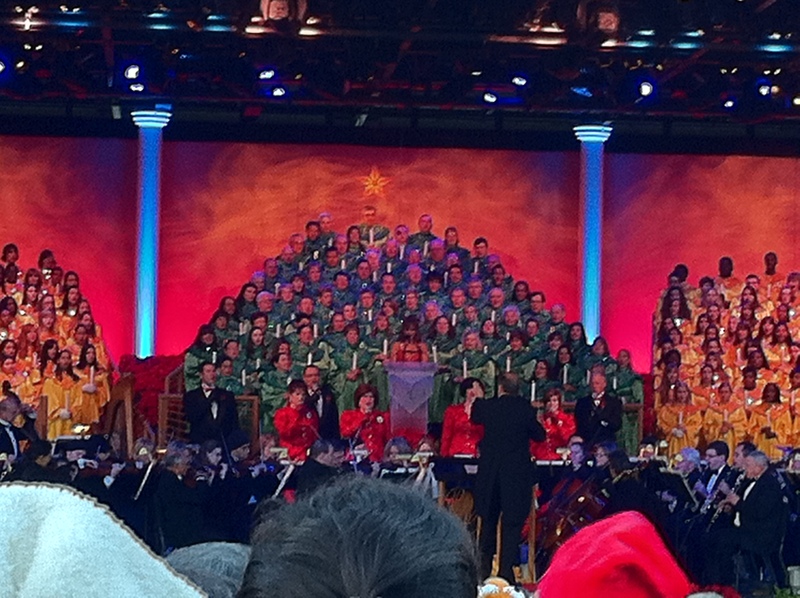 That show is absolutely worth the wait in line if you’re ever at Disney over Christmas! I am really looking forward to Christmas Eve and Christmas day with O next week. I’m always a bit of a kid about Christmas myself and to see him starting to understand what is going on has been really fun. I can’t wait to see what Christmas morning is like! Tuesday: Walked 30 minutes, which was really just a bonus workout as I just felt like moving but didn’t have time to get more of a workout in given the neighborhood cookie exchange that night. I’m proud of myself for not letting the stress of a social situation (I have trouble with social anxiety, getting better but still an issue) send me diving into the trays of cookies! I brought home treats and immediately packed them up to send to work with my husband, except for the ones that he wanted to keep at home. I also treated myself to the one thing that looked tempting and was definitely not something I would make myself – shortbread from one of my neighbor’s Danish grandmother’s recipe. 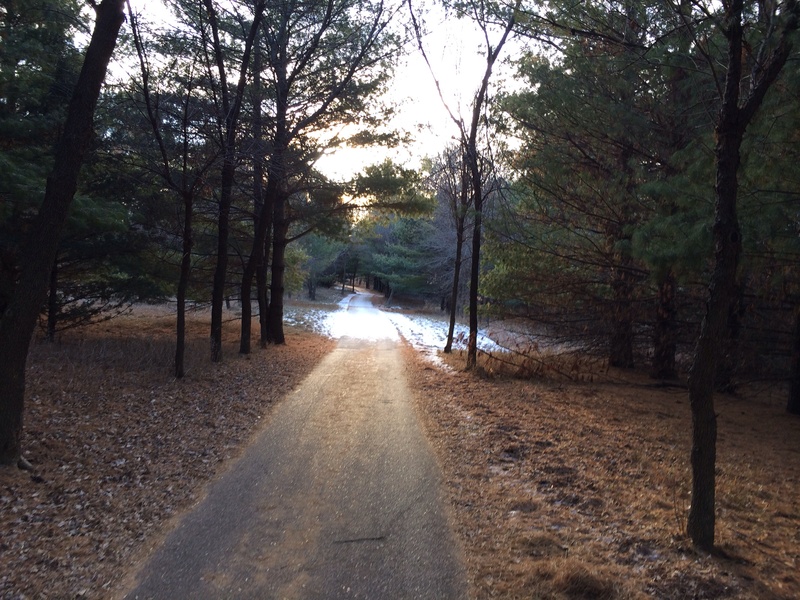 Wednesday: 3 miles on the treadmill – the cold weather is back. Friday: 4 miles outside (11:00 minute mile pace overall, with walk breaks) – this was my first run with the neck gaiter. I was pleasantly surprised by how well it stayed put on my face but between my cold and my claustrophobia, I found it to be really distracting overall. I ended up pulling it down after the first mile. When I got back into my house, I was entertained to realize that the mouth covering had gotten damp from my breathing and then frozen when I pulled it down from my face. It was cold out there (around 17-18 degrees) but it felt good to run outside. 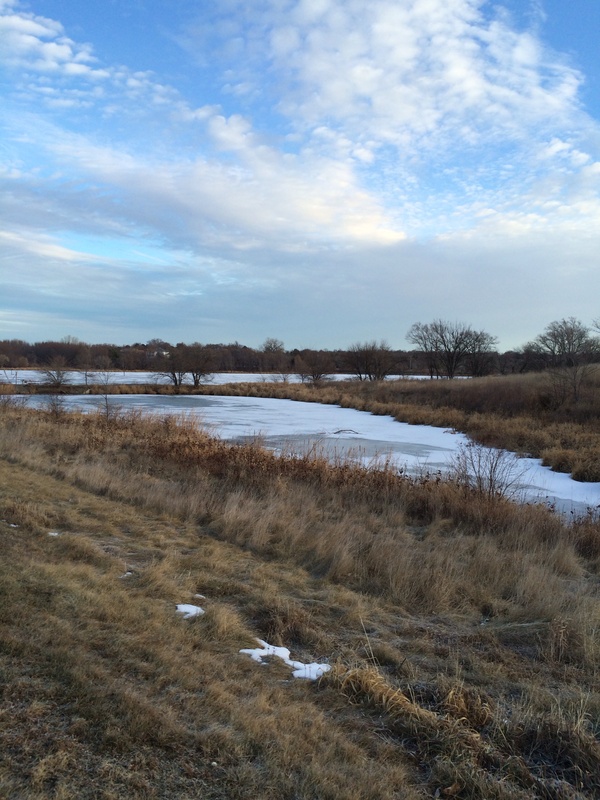 Thanks for all of the tips for running in the cold weather after my whine earlier this week. I got a new coat and base layers from Target, which definitely helped (although I still think I’ll put off that 8 mile run to a day without single digit weather!). Saturday: It was grey and windy, so I opted for the treadmill to get my last run of the week done. 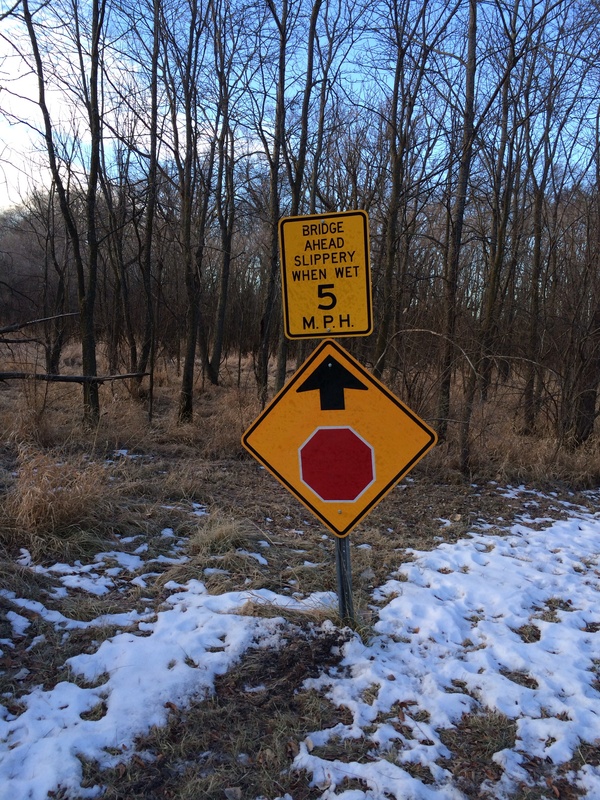 It was okay until the last mile, when I started having some aching in my left knee. I think my form stinks on the treadmill and that leads to the knee pain. I just need to remember to avoid back to back treadmill runs to keep this from becoming a more lingering pain. Thanks to the knee pain, it was a slower 4.5 miles than usual, but I got it done. Sunday: Rest day and some yoga, as well as planning my Fast Pass plus selections for tomorrow. 61 days until I arrive at Disney World! I did get some depressing news this week. My beloved Weight Watchers leader Noreen is leaving us. This Saturday was her last meeting and while I am not normally a tearful person, I cried when I hugged her and said goodbye. She has been such a solid touchstone for me in the last year and a half and has experienced more of this change with me than anyone outside of my household. So much of the Weight Watchers meeting experience has to do with your leader and Noreen is wonderful. She doesn’t just recite the WW script or push their products. She actually tries to get us to discuss the deeper issues behind our food and lifestyle choices and empower us to make changes on our own. She will be greatly missed. It is interesting to realize that the new leader coming in (I’ve heard great things about her, even before I knew she was taking over our meeting) will have no idea how much we have all changed, not in the way Noreen does having been with our group for so long. It’ll be interesting to see how things go in the new year. 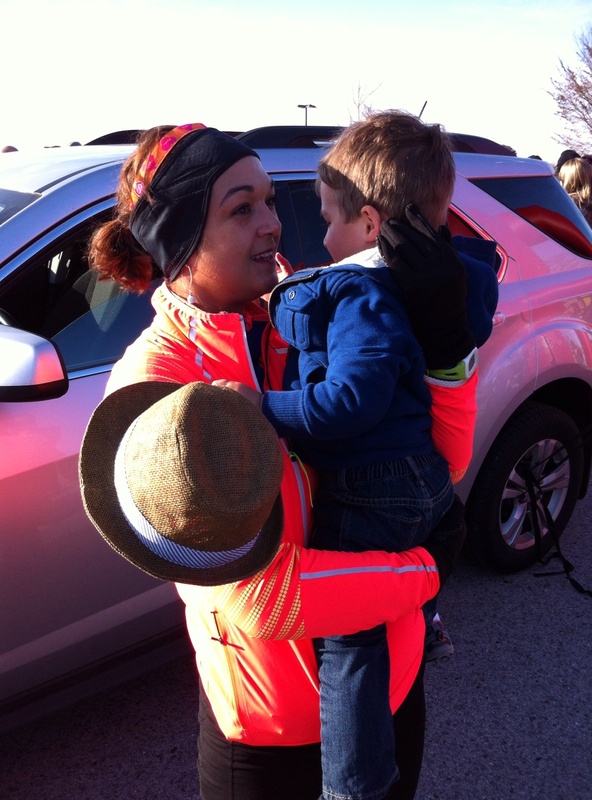 For this week, I wish you all the happiest of holiday seasons and hope that you find the same kind of joy in running (or whatever your physical outlet of choice is – keep it up to get through the stress of the holidays!) 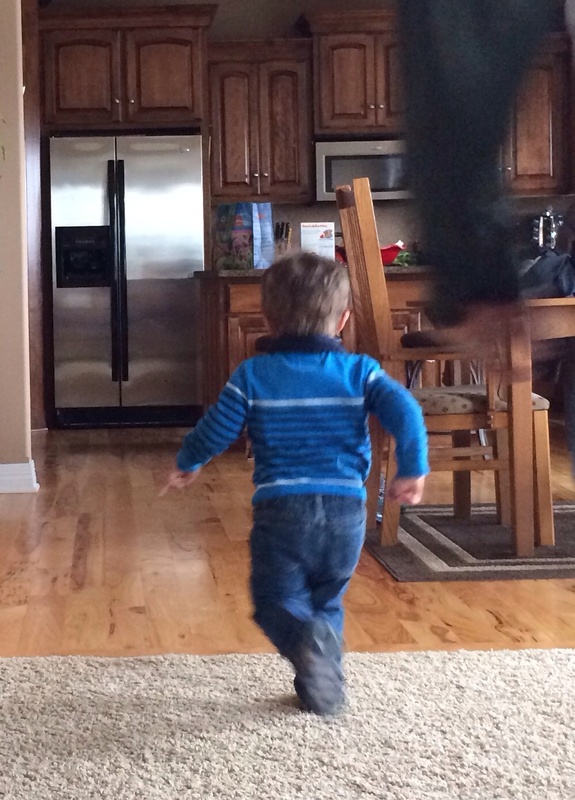 that my two year old finds in running.